The Penn Manor School Board recognized athletic director Jeff Roth and senior Ben Clark at their January 3 meeting. 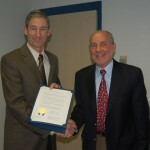 Jeff Roth was honored for being chosen as the District 3 Athletic Director of the Year. 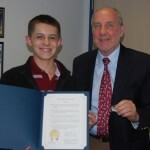 Ben Clark was honored for winning the Siemens Competition in December. This is the highest science honor for high school students in the nation. The recipients are pictured with Dr. Richard Frerichs, school board president. School board meetings are open to the public. The next meeting will be held on Tuesday, January 18 at 7:00 p.m. in the board room at Manor Middle School.